The areas that are best suited for solar units are in locations where you have to expect heat and, in some cases, also flooding. Solar cables that can withstand these extreme conditions are required, such as those made by Conservation of Energy Co. Ltd. in Thailand. Thanks to a special manufacturing process, this is exactly what Lapp cables promise. In the Asia-Pacific region, 420 GW of solar power is to be installed by 2030, at least according to industry experts. Rapid growth can already be observed, particularly in China and Japan but also in countries such as India, Korea, Thailand and The Philippines. Unlike in European countries, the climatic conditions there are often much more extreme. These requirements need to be reflected in the manufacture and operation of photovoltaic systems, especially as operators increasingly want to use humid areas for them. However, using conventional photovoltaic cables without special protection is not possible in humid areas. If “standard solar cables” are exposed to wet conditions over a long period, moisture can get into the cable, reducing the insulation resistance and thus leading to damage and failure. As a result, Lapp has developed the first permanently waterproof solar cable for these extreme conditions. The ÖLFLEX® Solar XLWP is an irradiated solar cable for long-term weather resistant use in solar units. For areas where flooding is common, or where the cables are laid underground in protective tubes, where water, heat and moisture can build up, this cable is perfect. In order to ensure the performance of the cable, the insulation resistance was measured every three months for a year at a test centre in Thailand. “With the ÖLFLEX® Solar XLWP we have developed the solar cable equivalent of a sports car. As well as meeting the requirements of the relevant standards, it offers a few extras, particularly its waterproof properties”, says Bernd Leushake, Manager Renewable Energy at Lapp Asia Pacific. The first major order for the new waterproof solar cable came from Kanchanaburi Province in Thailand. 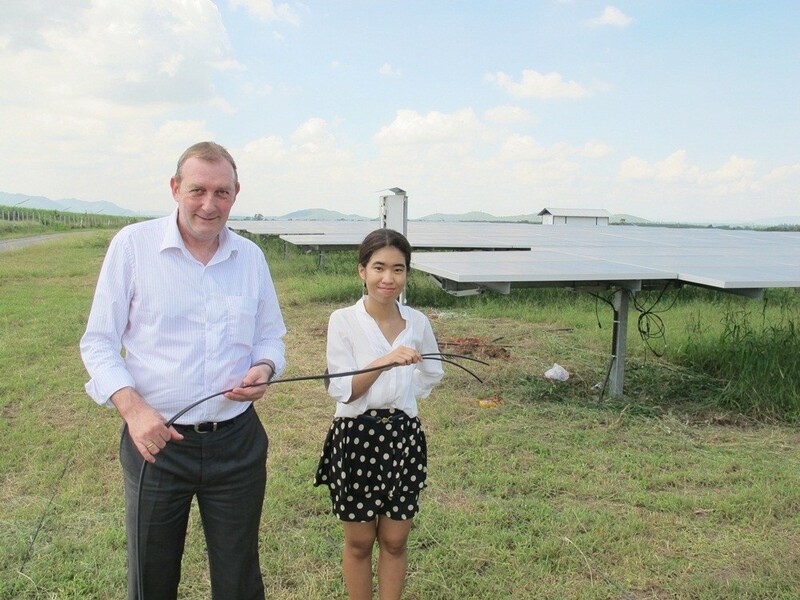 There, Ensys Co. Ltd. installed 192 km of ÖLFLEX® Solar XLWP cables. The operator of the solar unit and the client is the company Conservation of Energy Co. Ltd. The solar cables for this unit were produced at the Lapp Korea plant. At the plant is a dedicated electron beam irradiation unit that was commissioned two years ago. Irradiation with electron beams gives conventional “run of the mill” plastics, such as polyethylene or polyamide, the properties of high performance plastics, allowing them to be used under conditions for which they are not normally suitable. This is a cost-effective alternative to using expensive special plastics. Irradiated cables have improved heat resistance at higher usage temperatures, as well as better wear and abrasion resistance. Adaptation to the requirements of new materials or new tools is not necessary, as the irradiation is performed independently of the actual manufacturing. 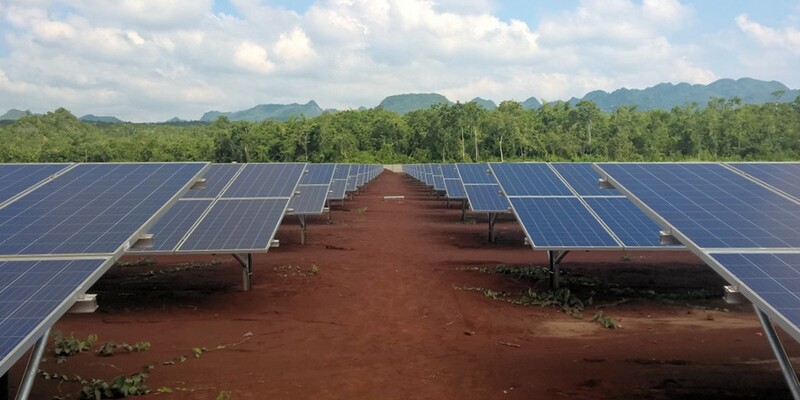 The company Conservation of Energy Co. Ltd. was founded in 2014 in Bangkok and is the first company in Thailand to effectively operate photovoltaic systems.